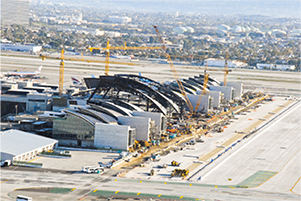 The Bradley West Project is one of the most ambitious airport projects in the country, involving the complete renovation, reconfiguration and a new West Terminal of the Tom Bradley International Terminal at Los Angeles International Airport (LAX), a 7-story building that will total more than 665,000 square feet. The project features a Baggage level footprint of roughly 158,000 square feet, with 24â€ thick retaining walls and architectural concrete towers standing nearly 90 feet tall. The project also provides fourteen new airline gates, capable of handling the next generation of super-sized jumbo jets, Walsh Austin Joint Venture is the construction manager on the project. Klorman Construction is the main structural concrete contractor, including Excavation and Backfill, Concrete Formwork, Steel Reinforcement, Concrete Placing and Finishing, Hoisting and Support equipment, and Below Grade Waterproofing with Sub-Drainage System. Klormanâ€™s Virtual Design and Construction Department was responsible for the Building Information Modeling (BIM), a way to effectively and efficiently manage the project and coordinate various tasks, including concrete formwork, shop drawings, scheduling and resource management.